Are You Still Using Those Traditional Glass Screen Protectors that Bubble and Smear? Are you still using a traditional plastic screen protector? There is not one but many strong reasons why traditional glass screen protectors are no longer the way to go. Our Bubble free screen protectors ensures a bubble free protection with smooth finishing. You may be familiar with the feeling of having to stare at the fingerprint covered screen or bubbles on screen of your device because your smartphone screen protector is so hard to clean. Or when you put your phone in your pocket or purse with your keys, only to be welcomed by new scratches the next time you switch it on! And the worst, those annoying bubbles that cover up your screen? Not to mention the fact that your cellphone or tablet are harboring more bacteria than a toilet seat! These are just some of the reasons that prove that traditional glass screen protectors should be replaced by something technologically advanced. Replace it with one that solves all these problems and more, especially when it comes to one that provides you with a bacteria free phone, not having more germs than the toilet seat. Imagine a liquid, invisible screen protector, shielding your phone or tablet in any given situation, giving you a clear view of your phone’s screen, thanks to a bubble free screen protector that is also easy to clean! Cystalusion. Living true to its name, it is a crystal like liquid glass that seems like an illusion, because it’s invisible! It utilizes revolutionary technology that coats the surface with a protective layer of advanced nanotechnology. Each molecule is 500 times thinner than a human hair and covers the pores of the surface resulting in an invisible yet hard coating. It defends the device against bacteria, abrasion, dirt, grease and grime. The bacteria free screen protector is both safe and natural. There is no risk of any health hazards whatsoever. Above all, the problem of pesky bubbles is gone, because it is not made of plastic, but a liquid that is applied to the surface, which results in a bubble free screen protector. Once it is applied, it will safeguard your phone for about a year, after which it can be easily reapplied. This invisible screen protector repels dirt and will ensure you a crisp view of your phone screen every time you pick it up. Cleaning is a snap because it only requires the light swipe of cloth. Unlike traditional glass screen protectors that require a lot more effort to clean. 1 x pre-treated cleaning cloth used to prepare the device for the application. 1 x pre-treated Crystalusion Wipe – Liquid Glass protection application cloth used to apply the protective layer. 1 x Microfiber cloth – used to upkeep your screen following application. 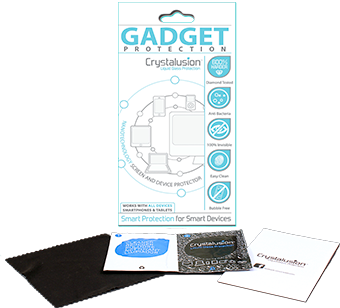 Don’t compromise with your device’s safety and get the best of all smartphone screen protectors out there- Crystalusion! Can you believe that the average cell phone hosts more than 25,000 bacteria per square inch! Your phone is dirtier than a toilet !!! Liquid Glass Protection is Antimicrobial, this means bacteria cannot live on the protective layer – helping you keep your device germ free. Our website is secure and protected my McAfee. What!??? My phone is dirtier than a toilet!